Regional IRIS Network, in cooperation with National IRIS Networks from Albania (National Coordinator Arsis Initiative), Bosnia and Herzegovina (National Coordinator LIR CD), FYROoM (National Coordinator La Strada), Montenegro (National Coordinator SOS Telephone) and Serbia (National Coordinator ASB), is announcing a Call for Peer Reviewers who will conduct the Peer Reviews within the IRIS NETWORKing initiative project. The Call will be on-going throughout the project duration i.e. until April 2021. The aim of the instrument is to enhance regional know-how exchange between CSOs dealing with provision of social services to vulnerable groups, including migrants, and to support focused peer-to-peer exchange. The peer-reviewers will be responsible for a review focused on the work of CSOs outside their country of origin. The Reviews will lead to innovative recommendations on how to combine existing practices. Within the project duration it is foreseen to prepare 30 independent peer-review reports based on pre-prepared methodology in line with the Peer Review mechanism developed at EU level under the Open Method of Coordination. The purpose of this mechanism is to strengthen IRIS Network members in building monitoring capacities for social service provision. National teams of peer-reviewers will be established in each country and will be included in National Database of Peer Reviewers. Specifically, the mechanism aims to improve capacities of CSOs social service providers in a wide range of areas such as – project implementation, networking, service delivery to migrants and campaigning at the local level. The responsibility of the peer-reviewers will be to provide written reports and analyses for predefined tasks, which will closely follow implemented activities. Special priority will be given to field visits of the reviewers, during which they will be able to directly interview their peers as a part of the peer-review process. The topics of each Peer Review will be defined prior to each round, Peer Reviewers included in the Database will be timely informed and will have an opportunity to apply for specific topic(s) of their interest. 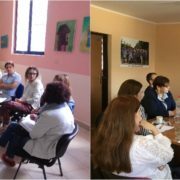 During May 2018, IRIS continued with partnership building meetings with National IRIS Networks in B&H and Albania. For this purpose meetings were organized in Sarajevo and Banja Luka (B&H) and Tirana (Albania). The aim of the second round of meetings was to facilitate the accomplishment of the Network’s goals and present objectives and main activities planned by the project IRIS NETWORKing – CSOs for protection sensitive migration management. Representatives of more than 28 organizations, members of the IRIS Network, gathered around the idea of contributing to long-term goals of the Network – increased quality of social and legal services provided by CSOs through capacity building activities, increased resilience and social cohesion of the local communities through civil society networking initiatives, strengthened national/regional coordination of the CSOs and public institutions in migration management and influenced reform processes in Western Balkans in order to improve service delivery for the migrant population. The meetings were co-organized by two Project partners, LIR CD in B&H and ARSIS from Albania. LIR CD, Bosnia and Herzegovina – founded in 2012 in Banja Luka as a citizen association. LIR Civil society arises as a successor and advocate of the Local Development Initiative (LIR). Through its engagement, the LIR Civil society wants to contribute to ensuring that the policies and programs of socio-economic development are adequate and effective. LIR CD is active in the field of strengthening social inclusion, establishing and strengthening CSO networks at the local and regional level in the field of social entrepreneurship development, conducting public advocacy and research campaigns in the field of human rights protection, providing the necessary assistance to refugees and displaced persons and other vulnerable categories of population. ARSIS, Albania – Established in 2006 in Albania, ARSIS is a non-profit organization focused on providing youth support. For years, ARSIS has built the reputation of an active provider of quality programs for children within vulnerable groups, young people, women and families at risk. ARSIS is committed to establishing strong and influential relations with government representatives and civil society organizations. ARSIS programs are tailored to the user, with the aim of providing access to basic services, social inclusion and sustainable solutions for those who need it most. Following the current developments regarding migrant route along Western Balkans, an unexpected result of the project will be exchange of experience and knowledge regarding migrants trans-passing Western Balkans on their route to EU countries. During the drafting of this project proposal the main migrant route lead through Macedonia and Serbia on route to EU countries. At the time there were no projections that the route could be altered in the near future and would run through other countries in the region. However, recently the route has changed and runs through Albania and B&H, where the number of migrants is continuously increasing. Therefore, IRIS Network partners from Serbia (IDC and ASB) and Macedonia (La Strada) will transfer their knowledge and experience regarding migrant management to Arsis (Albania) and LIR CD (B&H), which will impact migrant protection, including provision of services and referral pathways.